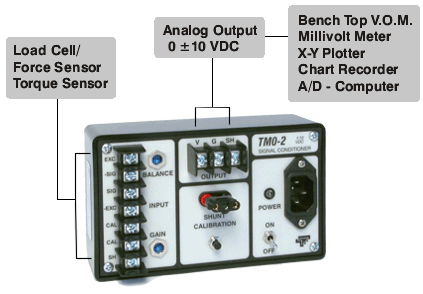 The TMO-2 Transducer Modules is a complete differential amplifier/signal conditioners with self contained power. The units provide excitation, balance and span adjustment via precision 10 turn pots, and shunt calibration necessary to couple a user supplied bridge type transducer to an indicating instrument. Full scale output is specified at plus or minus 10 VDC. The TMO-2 provides a floating shunt calibration circuit which applies calibration at the transducer, thereby eliminating errors due to line losses. The excitation supply incorporates a Wagner Ground to greatly improve Common Mode Rejection. The factory set bandwidth of the module is narrow to improve stability for applications such as weighing scales. The removal of a single capacitor will increase the frequency response DC to 60K Hz for dynamic data applications. Weight: Less than 2 lb approx.